“The Cavaliers” band was formed in 1956. Original founding members from San Angelo, TX, were Alton Baird (vocals/guitar), Carroll Smith (upright bass), and Sid Holmes (lead guitar). This band was active for many years. Alton Baird started his own band, and Sid Holmes moved to Ft. Worth, TX and continues to use “The Cavaliers” name in that area. 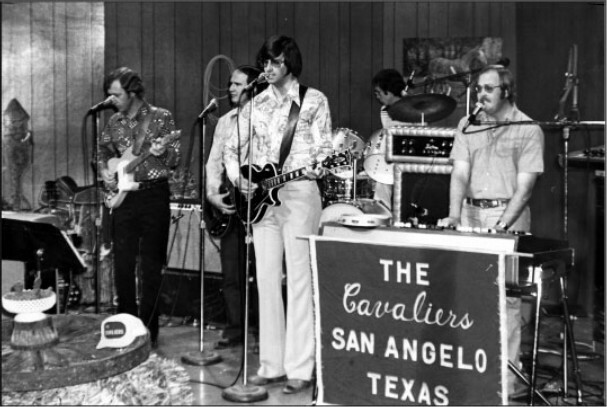 In 1964, J. Frank Wilson and “The Cavaliers” from San Angelo, TX, released their hit song, “Last Kiss”. The band members at that time were Lewis Elliott (group manager/bass guitar), J. Frank Wilson (vocals), Gene “Buddy” Croyle (lead guitar), and Roland “Snake” Atkinson (drums). Jim Wynne (keyboard) and female back-up singers were also used in the recording session. After these band members went their separate ways, Lewis Elliott again launched a new band in 1966. Those band members were Lewis Elliott, C.T. Jones, Ronny Harrison, Ronnie Miller and James Thomas, all from San Angelo, TX. A year or so later, Jim Patterson replaced bassist Lewis Elliott, who took a job with Goodyear Tire Testing. Ronny Harrison and James Thomas stayed in the band for many years – regrouping numerous times with Thomas trying to continue the local band’s legacy up until about 1998 or 1999 which, ironically was about the time Pearl Jam re-released the song “Last Kiss” again. While there were many, many talented musicians who were members of “The Cavaliers”, the band consisting of Calvin Bell, Janice Burke, Kerry Ford, Ronny Harrison, and James Thomas stayed together the longest and for the most continuous period of time, (+/- 8 years). Notably, Mike Jones and Bryan Boatler, spent a lot of time in the band as well. This website is dedicated to ALL of the musicians that have ever played in this group, and, most of all, to our fans who supported us. Special thanks to the 1956 original group and to the group that recorded “Last Kiss” and helped to make the song a nationwide hit record.